Managing NTFS permissions via GUI is not a trivial thing. One mistake and a lot of data is shared to wrong person. It gets even harder if you have to create lots of different folders and change their permissions in a special way… Fortunately you can help yourself with PowerShell and automate things a bit. So where is the problem? Well it's not so clear on how to actually achieve simple things like setting new permissions. 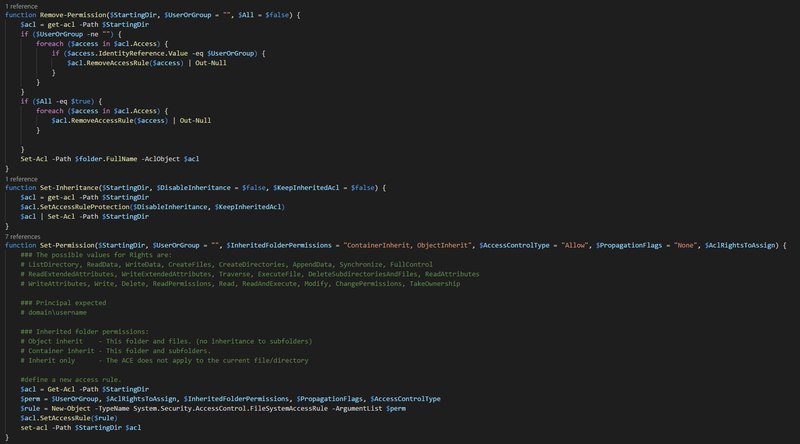 It took me a moment to figure it out and to simplify things I've created a few support functions that allowed me to control my final script in easy to read manner. # Container inherit - This folder and subfolders. #define a new access rule. Those 3 little methods are actually really powerful. I had little task where in F:\Shares directory there were user folders. Each folder having same permissions. What was expected is to remove current permissions and set new ones. User (with same name as folder name) had to have Read access, but others required special permissions. Above methods allowed me to easily set inheritance, remove permissions and finally set permissions on NTFS folder and all of the files inside. Set-Permission $folder.FullName -UserOrGroup "Domain\$($folder.Name)" -AclRightsToAssign "ReadAndExecute"
Set-Permission $folder.FullName -UserOrGroup "Domain\Domain Admins" -AclRightsToAssign "FullControl"
Set-Permission $folder.FullName -UserOrGroup "BUILTIN\Administrators" -AclRightsToAssign "FullControl"
Set-Permission $folder.FullName -UserOrGroup "SYSTEM" -AclRightsToAssign "FullControl"
Set-Permission $folder.FullName -UserOrGroup "Domain\domain.pklys" -AclRightsToAssign "FullControl"
While the code is not complete solution to working with NTFS permissions it should be enough to get things working :-) In easy, predictable way.